That’s it, another epic World Championship done! Let's take a closer look at the track, what went down, and who won this year! 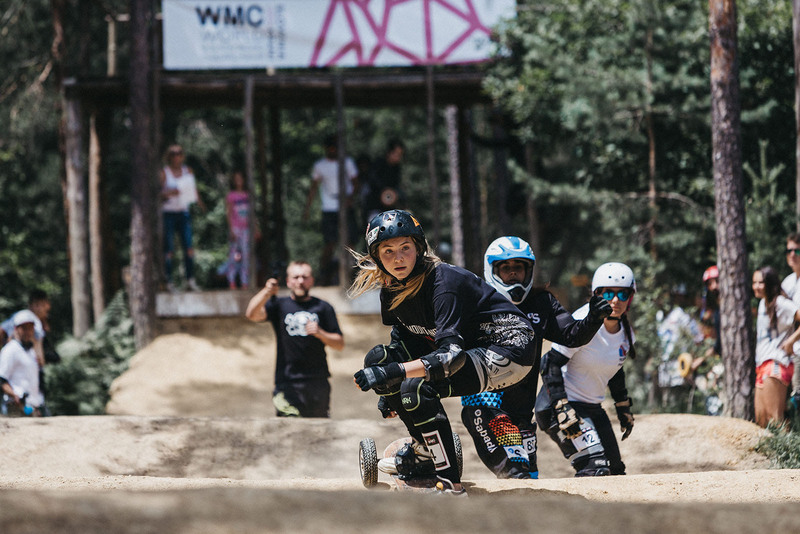 Every year, the World Mountainboard Championship is the biggest mountainboarding event out there. It attracts the most dedicated athletes from around the world, who gather for a few days to train and compete on race tracks and freestyle jumps and rails. This year, the Dirt Dessert based in Kranj, Slovenia stepped up to organise and run the event on June 29th-30th. The team had experience with previous competitions (such as European Championships) and their event got a lot of praise from athletes who attended, so the IMA was excited to collaborate: the Dirt Dessert team provided the venue, and all the work that goes with organising an event of this caliber, while the IMA would run the competition side of the racing and freestyle. The track was greeted with huge praise all-round from the athletes who enjoyed the relaxed but very fun nature of the track which also enabled racing wheel to wheel on the whole way down. Starting in the trees, the track flowed it’s way out into the open with twists and turns and smooth features, ending after a chicane and a 100m sprint to the finish over a few small features. This was the least technical track that the World BoarderX Championships have been held on, but probably the most raceable and certainly an athlete favourite from day one. The freestyle saw a rail become a main feature in the run for the first time since 2004, a welcome feature given the growing trend of rail riding in the sport. The rail was followed by two rollers which athletes could use to manage speed, change stance or pull small jib tricks before going into the two tables. The tables were the main features of the run, with athletes able to score up to 85 points on the tables and 15 points on the rail and rollers. The tables had quite mellow take offs and huge landings, allowing athletes to get extra hangtime by landing deep (but without risking blowing out their knees) and providing a nice smooth take-off, enticing the athletes into riding switch. The speed into table 2 was quick, but after some practice and adjustment of tyre pressues, the athletes mastered the run and were comfortable sending their tricks. Qualifying for BoarderX set the tone for the racing across the event - it was going to be tight. Tosa, unseeded for Qualifying due to a fall in the first round of the Knockouts last year, was drawn against Kody Stewart in the first race and was leading down the whole track, but unfortunately a slide in the final chicane prevented him from making the first big shock of the weekend. After the first round of Qualifying, a few athletes were starting to stand out and show that they meant business. Andy Brind, 3rd in 2017, posted the fastest time with reigning World BoarderX Champion Matt Brind in 2nd and rising Polish star Dominik Kaminski in 3rd. With times to aim for, the top athletes put their heads down and got to work. After the second round of Qualifying, Andy Brind managed to cut a good margin off his time but it wasn’t enough to hold his older brother Matt off who moved into the top spot, pushing Andy into second and, now with a clean run, Kody Stewart jumped into 3rd 0.2s behind Andy. The three of them separating themselves from the pack, almost a clear second ahead of 4th place Dominik, in the hunt for the top qualifying spot. Knowing that the top Qualifying positions, and potentially gate choice in the Finals, were on the line, the athletes set about aiming for the absolute maximum they could extract from the track. Matt was the first down, blitzing to a new fastest time and moving 0.55s ahead of Andy who was in 2nd. Next up was Andy. A minor mistake at the top meant Andy opted to cruise his run and save his energy, knowing he couldn’t improve and leaving it down to Kody as to whether Andy would qualify 2nd or 3rd. Working every feature at full power all the way to the finish line, Kody earned himself a time 0.6s faster than his previous and jumped ahead of Andy into second place, but not quite fast enough to take the top spot from defending champ, Matt, who took the top spot from Kody by 0.15s. It looked like one of the three would take the title, even at this early stage, as 3rd place Andy was separated from 4th placed Dominik by almost a second.The scene was set for what could be an epic showdown between the top 3 of Matt, Kody and Andy in the hunt for the World BoarderX title. In the Ladies category, defending champion Senka Bajic of Serbia continued the fine form that saw her take her maiden World title in 2017 to qualify 1st, 3.5s clear of 2nd place Maja Bilik of Poland and Manue Kedad of France in 3rd. For the Masters, it was a very close battle for the top Qualifying spots. In the end though, home favourite Tilen Javornik put in a storming performance and qualified top, a massive 1.1s ahead of Gregory Barbier who took 2nd for France and Pestu of Spain who was in 3rd. TJ, in fact, put in the 10th fastest time of all the athletes! Over to Freestyle and Qualifying for the Pro category - a 90 minute jam where athletes could have 3 judged runs, with their best run counting. The top 12 athletes would make the Pro category and compete over 5 runs in reverse Qualifying order. It was pretty smooth sailing as far as Qualifying goes - both Nicky Geerse and Matt Brind fell on their first runs, providing the main drama, however they both landed their second runs to ensure progress to the Finals. At the end of the session, the top 4 were very closely poised with Polish Dawid Rzaca in 4th, one point behind Evgeny Vyborny of Russia in 3rd who himself was only 1.5 points behind Krzysztof Dybczak of Poland in 2nd who was 1.5 points behind Matt Brind of the UK. With the first round of Knockouts on display, Kody Stewart said what everyone was thinking ‘every race is basically a Finals’. The quality of the athletes was at an all time high and no result was guaranteed - case in point, the 5th qualifier James Wanklyn was caught in a race long battle with Matteo Andreassi and David Hutter fighting for 2nd place (while Krzysztof was out in 1st) and a spot in the next round, eventually coming short and being knocked out in the first round and placing 25th in the final standings! Gate drop during a Pro race. The loss of James, who placed 5th in 2017, was the first big shock of the racing. Every race was proving to be a battle for all the athletes. In the Quarter-Finals, Evgeny Vyborny, who came 2nd in 2017 and 2014, was the next big name to fall as he bowed out to the Polish power pair of Krzysztof and Domink, and the 10th seed Connor Smout lost out to Andy Brind and Arno VDV, Arno making the Semi-Finals for the first time after 3 previous Quarter-Final appearances. The Semi-Finals were stacked, with defending champion Matt Brind facing off against Krzysztof Dybczak (5th in 2015), Dawid Rzaca (6th in 2016) and Arno VDV in the first Semi-Final and former champion Kody Stewart, current number 3 Andy Brind, current number 4 Joel Treliving and 4th qualifier Dominik Kaminski. In terms of Qualifying positions, the second Semi-Final looked particularly crazy, featuring the 2nd, 3rd, 4th and 8th seeds. For the Masters, the first Semi-Final saw 2 Slovenians face off against 2 French in Tilen Javornik and Jaka Lah against Ludo Faure and Vincent Lavaud. Tilen and Ludo both got a great start and found their way cleanly into the Finals. The second Semi-Final saw possibly the craziest first corner clash of the whole competition as Gregory Barbier, Pestu, Scott Leadbitter and Mikael Gramont did battle to make it into the Finals. All 4 athletes put in fantastic starts and went 4 deep into the first corner, with Mika being forced off the inside of the track up a ridge. Somehow he held that and also held the bigger drop onto the track over a drainage ditch. Gregory now had a small lead but Pestu, Scott and Mika were all still together. Mika managed to slot in just ahead of Scott and it looked like that may be how the order would finish, but a flat tyre for Pestu at the end of the first corner caused further carnage as, in dodging the rapidly slowing Pestu, Mika and Scott collided but both somehow stayed up, with Mika holding on to take second and make it to the Finals for the first time. In the Ladies, the late arriving Simona Petro from Italy, the 2015 Champion, had all the work to do. With a good start, Simona slotted in behind Senka and never looked back as she secured her place in the Finals. The second Semi-Finals was close at the top, but eventually finished in Qualifying order with Maja Bilik and Manue Kedad progressing to the Finals. 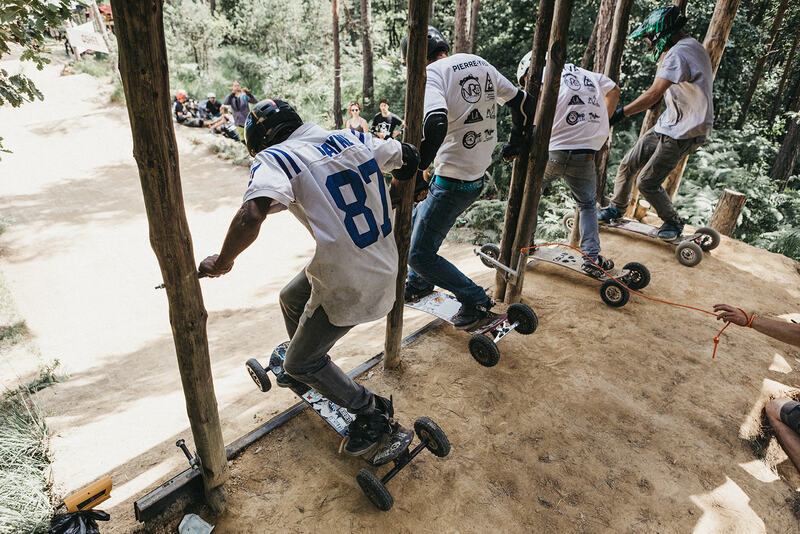 The Pro Semi-Finals were intense, track long battles at the highest speeds the track had seen so far. In the first Semi-Final, Matt got a great start to hold off Dawid into the first corner and progress to the Finals in first place. Dawid also got an excellent start and managed to jump his compatriot Krzysztof and claim the second spot in the Finals himself, pushing Matt the whole way down the track while Krzysztof simultaneously chased him down, looking for any change to pounce. In the second Semi-Final, Kody Stewart and Andy Brind laid down a statement of intent, both getting clear of third and fourth placed Dominik and Joel by the first corner and cruising to the Finals in first and second. The Finals rolled around and up first were the Juniors, but not before a promotional race between the youngest and oldest competitors, Oskar Rappl of Slovenia, 8, and Carlos Sabino of Brazil, 52, both enjoying the cheers and energy from the crowd. The Juniors Final was a close fight between the top 2 qualifiers for the win, with Karol Chlodek beating Flynn Bulens to the trophy. Konrad Bik and Simon Gilloteaux also had a close battle for the final podium spot, with Konrad narrowly beating Simon to the line. It was the Ladies turn, and much like all weekend Senka Bajic never looked like losing. An impressive start and top section from Senka gave her a commanding lead that she’d never lose on her way to a second World BoarderX title. Manue took 2nd into the first corner with Maja in 3rd and Simona in 4th but Maja made a mistake, leaving the door open for Simona to pass and finish 3rd, with Maja 4th in her first World Championships. The Masters rolled up and the question everyone was asking was ‘can anyone stop TJ?’. The answer? No. It was France vs TJ as the other 3 finalists were all of French origin, however TJ dominated the race from start to finish and claimed his first Masters World BoarderX title on his home track. Gregory Barbier held off Ludo, the 2015 champion, to claim second and third respectively with Mika Gramont finishing 4th. One question remained and it was the set up everyone had been hoping for from the start of the weekend - four time champion Matt Brind vs 2013 champion Kody Stewart vs 2017 no 3 Andy Brind, with the incredibly fast Dawid Rzaca in there hoping to cause an upset. The three main favourites, the top three qualifiers, would face off in the Final. The hunger was high, especially with Kody looking to make amends for 2015 and 2016 where he came second to Matt, with Andy looking to claim his maiden title and finally beat his brother on the biggest stage and with Matt looking for a 5th title in a row. The benefit of qualifying in the top 2 now apparent, with Matt and Kody lining up their preferred gates while Andy had to settle for third choice, they prepared for the biggest race of the year. With the athletes strapped in and ready to go, the gate dropped. Great starts from all athletes, but Kody Stewart got ahead by half a wheel into the first roller. Kody and Matt pushed at their absolute maximum over the start straight in a drag race that they knew would likely crown the 2018 champion, separating themselves from Andy and Dawid in the process. Into the hip and Kody had half a board’s lead, which turned into a full board as Kody had the inside line of the hip and he proceeded to execute an inch-perfect move into the first corner which shut down the inside line from Matt by mere millimeters and secured Kody’s lead. Behind, seeing what was happening just in front, Andy opted from a wider line in the first corner in the hope of hooking the rollers up better and getting more exit speed to attempt a move on the battling Kody and Matt. It was a smart idea except for one detail - he hadn’t seen Dawid. Dawid was behind but dived down the now uncovered inside line, making the move stick to steal 3rd place away from Andy. A flawless run from that point on from all athletes saw Kody and Matt build a small lead over Dawid and Andy while staying within a meter of each other. No matter how hard Matt pushed, Kody had the answers, leaving Matt with nothing to do but clap along the final straight as Kody reclaimed the World BoarderX title for the first time in 5 years, with the build-up of 5 years waiting exploding from Kody as he crossed the line to raucous cheers from the waiting crowd. Andy hustled Dawid down the rest of the track, but an impeccable race and strong defence from Dawid denied Andy a return to the podium, as Dawid and the Polish celebrated a well earned bronze medal. With the excitement and adrenaline of the BoarderX at an end, focus switched to the Freestyle. Simon Gilloteaux of France took the victory in the Juniors over Flynn Bulen of Belgium with floaty bs 360s and stylish grabs. Simona Petro returned to the top step in the Ladies with big airs and well held grabs, with Manue Kedad taking 2nd and Lais Lah Morimoto of Brazil in 3rd. Pestu set about making amends for the BoarderX with the biggest airs of the whole competition, landing deeper than anyone in landings and throwing some of the most style bs 360s seen on his way to claiming the Masters title. Vincent Lavaud of France took 2nd place with a combination of 360s, 180s and switch 180s with Mika Gramont, also of France, taking 3rd with stylish, controlled and tweaked airs. This set the scene for the Pro Freestyle Finals, and the excitement was high in anticipation of seeing Matt Brind vs Nicky G vs the Polish, especially after 2017s memorable showdown. Unfortunately, this time it wasn’t meant to be though - in the final practice run before the competition, Nicky had an awkward fall and broke 2 ribs, ruling him out of the competition and confining him to the ambulance and hospital. We're pleased to see that Nicky is well on his way to recovery and we look forward to seeing him on a board again very soon. Naturally the atmosphere dropped a bit as it always does when an athlete gets hurt, though within a couple of stunning runs of the competition the spectators and athletes were pumped back up. With only 5 runs and their best 2 counting, most athletes opted for a ‘banker’ run to begin with - something pretty good that they’ll always land. After round 1, defending World Freestyle Champion Matt Brind put down an early marker with his cab 5 to fs 5 putting him top for now, with Evgeny in 2nd with a solid 360 to frontflip and Dawid in third with a backflip to 360. It started going off on run 2 - James Wanklyn, who finished 3rd in 2017, sending his own cab 5 to 5 combination, Krzysztof landing a 720 to backflip and Arno VDV sending a unique monkey flip (fs 360 handplant) on the first table. After the second runs, the top 3 were all within 3 points of each other - James in 3rd on 130.5 points, Dawid in 2nd on 133 and Matt in 1st on 133.5. With the competition closely poised, and with 2 runs already in the bank, the top 3 raised the bar again. James went first, sending a switch bs 540 for the first time in years on table one and finishing his run with his trademark frontflip, bumping his score up to 157 points and first place. Dawid responded with a fs 540 to switch backflip, earning him a whopping 92 points and pushed him up to a total of 171.5 points and the new lead. With everyone else throwing down, Matt went for all he had sending a fs boardslide, nollie frontflip, fs 720 and bs cork 540 to land the highest scoring run of the competition of 96 points, reclaiming the lead on 176 points. Round 4 saw the athletes push even further, but with the consequence of the level of the competition beginning to back it’s toll. James went for a switch bs rodeo on the first table, but got his take-off wrong and couldn’t stick the landing. Dawid also fell while he attempted a 720 on the first table, bending a truck in the process. Matt went for a set up run, hoping to build on it in his last run, popping a no comply 180 into the roll in of the first table and sending a switch bs 180 one footer and a fs 360 one footer. Catching the knuckle on the first table meant he didn’t improve his score. Into the last runs, most athletes couldn’t improve on their scores and with Dawid opting out of taking his final run due to a broken truck, it left Matt to put in a victory lap of a backflip to a bs 360 method. Dawid held on to 2nd place with James in 3rd. In classic fashion, the Pro Freestyle Finalists put on a final train to close out the competition and the event to wild cheers from the crowd. All that remained was the prize giving and the afterparty, both going off in true mountainboard style. A huge congratulations and thanks to all the athletes and organisers, we’ll see you next year! Everyone's super grateful for the work the Dirt Dessert put in, as evidenced here!